Visit the NASA Goddard Visitor Center in Greenbelt, Maryland, U.S.A.
Space museum located in Greenbelt, Maryland, U.S.A.
You can feel the power of the sun in the Solarium, a room where an extremely detailed video of the sun is projected onto a large screen. You can admire the bubbling on the surface of the sun and see the incredible spectacle of solar flares. Take a walk through the many rockets of the Goddard Rocket Garden and Astrobiology Walk. 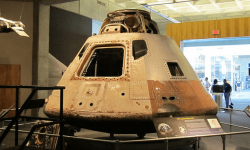 You can see in addition a beautiful replica of an Apollo capsule. In this NASA space museum, you can learn a lot about Hubble and James Webb space telescopes, Lunar Reconnaissance Orbiter (LRO) and more. How to go to the NASA Goddard Visitor Center ?